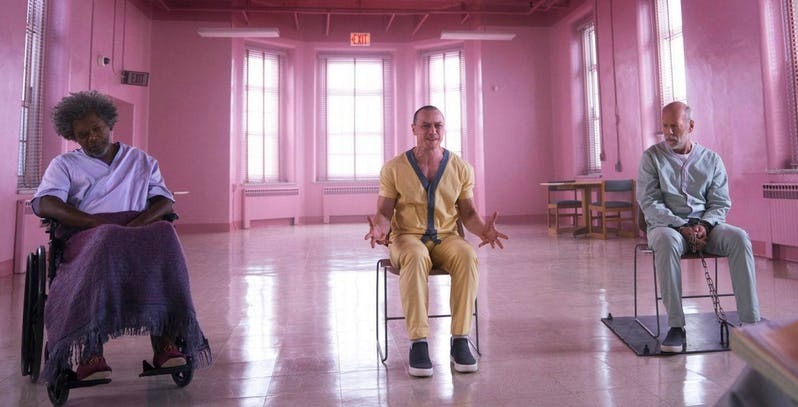 What an exhilarating moment it was at the end of M. Night Shyamalan's 2016 thriller Split when his latest twist delivered to Unbreakable fans the delayed gratification they didn't even know was coming. That the filmmaker's unfulfilled Eastrail 177 trilogy was actually unfolding before our eyes, and that Split was a supervillain origin in much the same way Unbreakable created a brand new hero, sent expectations to the moon for Glass. Shyamalan cuts himself no slack with this ambitious effort, attempting to deconstruct the superhero mythology while rebuilding a two-decade-old storyline and delivering an exciting comic book movie. It nearly becomes too much for the film to bear, but while it certainly has cracks, Glass does not completely shatter under its own thematic weight. In true Shyamalan fashion, there is a lot of explaining and expository dialogue that needs to be plowed through before the story really gets going. Not fully trusting his audience has always been a Shyamalan tic, it goes right along with his need to pull the wool over their eyes, but there's a lot of catching up that needs to be done here. If you're an Unbreakable fanatic as I am, you'll welcome every word of it. Bruce Willis returns as David Dunn, the unbreakable hero now known to the public as The Overseer, still playing vigilante hero with the aid of his son Joseph (the returning Spencer Treat Clark), who is acting as the Oracle (it's a Birds of Prey reference, folks) of their operation. Upon learning of the multi-personality serial killer Kevin Wendell Crumb (a chameleonic James McAvoy) and his superhuman persona The Beast, David sets out to stop his latest murder spree. In true comic book fashion, this leads to a physical clash in which David's invulnerability is put to the test against The Beast's might, but before a true victor can be decided they are both taken into custody and thrown into a mental institution. There, they are joined by the previously-captured Elijah Price (Samuel L. Jackson) aka Mr. Glass, who has been there for years under sedation but is no less a schemer than he was before. Shymalan's voice as the comic book skeptic is echoed through Dr. Ellie Staple (Sarah Paulson), who tells the trio they are suffering from delusions of grandeur, and she has three days to cure them otherwise they'll be imprisoned forever. Unbreakable was never about flashy superhuman powers or world-threatening plots; it was a simple character study about what ordinary men would do if given extraordinary gifts. When the film opened in 2000, we had yet to experience the superhero movie boom we're currently in, and it fit oddly against the X-Men and Blade which were the major franchises at the time. The result was that it did modest business at the box office, was unfavorably compared to Shyamalan's debut The Sixth Sense, and took years to become the cult classic it is now. Glass is a lot more like Unbreakable than Split, rolling out details about his characters in a slow burn that some might find infuriating. Again, if you are invested in this story before the opening credits have even rolled, there will be a lot to love. While the continued relationship between David and Joseph has its plucky charms, it's the "villains" who Shyamalan seems to connect with most. Anya Taylor-Joy reprises her role as Casey Cooke, who forged an unlikely connection with Kevin during Split. Through her we see Kevin as someone so damaged by tragedy and abuse that he had to create The Horde, the collective name for his many personalities, just to escape from reality. Also thrown into this mix is Elijah Price's mother (the returning Charlayne Woodard), who in the teasers is presented as more of an enabler than the concerned-but-understanding parent she is in the movie. Shyamalan does something we don't typically get from the comic book movies by the big studios, which is dig into the loneliness and sadness that come with these incredible powers, but of course the genre demands a big super-powered showdown, and at least one teamup. The path Shyamalan takes getting there is long and winding, with glimpses of brilliance throughout. The stories of David, Kevin, and Elijah as they struggle with, and even begin to question, their own identities are fascinating and raises the stakes for each character. But rarely does Glass ever reach the heights we were expecting, nor does it say nearly as much as Shyamalan seems to think it does. Shyamalan also can't help himself, simultaneously dolling out too much information while dropping one too many reveals of diminishing impact. The last one, which caps off an unimpressive fight scene that proves Shyamalan should stick to dramas, is presented as the kind of "ah ha" moment we've come to expect from him, but all it's likely to do is leave you disappointed that such a long wait amounted to such a numbing conclusion.